've started to have dreams while I'm awake. I remember music I've never heard ... I've got all this extra stuff in my head, but I'm forgetting things from my own life. I feel like I'm being taken over. 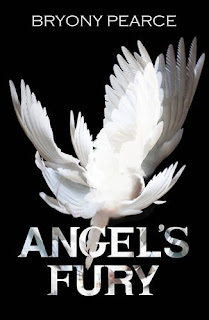 Angel's fury was a totally different kind of book. Not quite romance, not historical, not a thriller but a weirdly satisfying combination of the different genres that worked really well. The press release compares it to the book thief, which is fairly accurate in its style and tone but not necessarily in content or storyline as such, but if I had to compare it to another book that would be the book I would probably compare it to as I would say for me they had a similar feel to them. The book's main protagonist Cassie is a teenage girl who has dreams which are terrifying and nearly always violent and she is desperate to find a way to stop them. Whilst on a visit to Germany a chain of memories are stirred in her which leads to a chain of events which make her realise that the dreams are actually scenes from her past lives that she is now remembering and she starts the hunt for someone to help her to get them to stop. The solution to solve her problem appears to come from a specialist doctor who runs a facility for young people with past life experiences. Cassie moves into the Manor in the hope that she can find the respite she so desperately is after but ends up dealing with a much wider and more sinister problem along with the manor's other residents as the treatment they are often becomes more and more extreme and Cassie experiences increasingly more frequent and more disturbing dreams. I loved the ideas behind this book. I thought it was clever and well thought out and original in its execution. I loved seeing and hearing about the characters past life experiences and how they affected each of the residents of the manor differently. As the story goes on it becomes clear that the children have been brought together because of something far greater at work than them. Again the ideas behind this were quite good and I enjoyed seeing how it all pieced together. To sum up this is a uniquely different read from a brilliantly promising British debut author. It is well worth a read and one I would thoroughly recommend. I think I may have read this at the wrong time. I thought it was good but wasn't blown away. Great review though.